By far the most popular food plant grown in hobby gardens in America is tomatoes. Tomatoes grow in gardens, on porches, patios, and even flower beds. Growing tomatoes is easy, fun, and tasty. Container growing is a little different than in-ground growing; however, so many are confused when their otherwise healthy tomatoes turn bad in a container. Container growing has many benefits for the gardener. The first is portability. When the weather turns foul or the sun changes, the containers and their plants can be moved to safety or better light. Container gardens also have the benefit of being used even when your home does not have a yard or growing area – apartment and condominium dwellers can still enjoy fresh tomatoes, even without a garden plot. Another benefit is the ability to bring the tomatoes indoors to create a 365-day growing season. Containers can be utilized on the porch or patio, in a window, or any combination thereof. That makes for year-round growing. Finally, for the gardener, containers have one distinct advantage over the ground: they can be controlled. The soil’s type and contents, drainage, and even temperature can be controlled easily in a container. These are important for the gardener. There are many breeds of tomato suited specifically for container growing. Patio, Early Girl, Stakeless, and others are all hybrids meant specifically for container gardeners. Other smaller types such as Pixie, Tiny Tim, Toy Boy, Micro Tom, Floragold, and Big Boy tomatoes can also be grown in containers. When you choose your variety, be sure your pots (and their stands and support hoops) can accommodate the choice. Big Boys will need a larger pot than will Pixies, so choose accordingly. Nearly all will also require supports – stakes, hoops, trellises, etc. Make sure your hoops will fit in or around your container as well. Whatever your choice of variety, all tomatoes will need similar things to grow well in a container. The size of the container is important, of course, as is the soil mix. 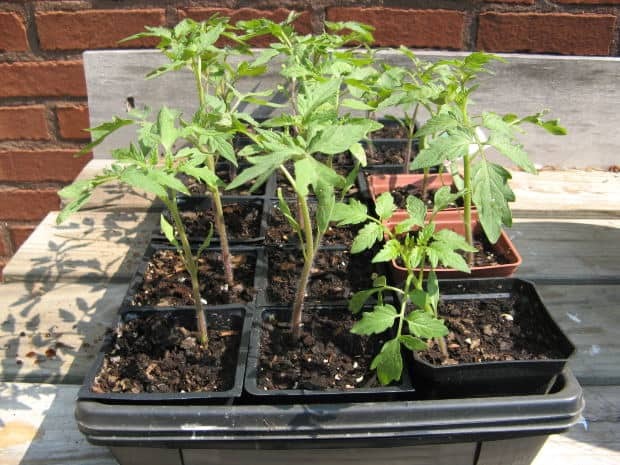 There are potting soils made specifically for tomatoes, but any container mix (for flowers, potted plants, etc.) will likely be the right mixture. If you’re making your own soil, use a 1:1 mix of good compost and well-aerated topsoil. If using terracotta or clay pots, use a liner specifically made for that type of pot to keep mold at bay and to keep water from seeping away. Ceramic pots should definitely have a liner for mold. Make sure your pot choice has good drainage and you use a barrier of some kind to keep the soil from draining out with it (pebbles, peat, plastics, etc). Those who plant from seeds will likely want to start their seeds separately and then choose the healthiest seedlings for transplanting to a pot. Place the plant directly at the center of the pot and, unless your pots are very large, use only one per container. Staking or supporting the plants as they grow is another concern. Most can put their hoops or tomato trellises directly into the soil of the pot. Some pots are made specifically for tomatoes and will have “hooks” or built-in trellises for them. Large hoops can also be placed on the outside rim of the pot and tied to the container itself. However you do it, make sure your supports are strong and on a good foundation. There are many containers to choose from. Traditional choices like terracotta and clay are always a favorite. Ceramics are nice for aesthetics, but can lead to mouldy and diseased plants if not well cared for. Plastic containers have great advantages over others, but can deteriorate or crack under root pressure and sunlight. Woven and wooden containers are fun and work well, but are generally one-season only, as rot and deterioration will usually break them down by the second year. The new fabric pots are a good choice, usually made from natural fabrics or from plastics, these provide great drainage and other benefits.